Is it possible to truly create artificial intelligence? Fabricated beings which truly experience the same fears and desires as ourselves? Given the rapid pace of advance in AI research and computing power we may find out soon. This means asking ourselves some serious questions. How would we treat such beings? Would they exist on an even footing with us, creation alongside creator? Would they be independent, autonomous agents or would we seek to control them? And would we, as the creators, be justified in treating them as we treat our mp3 players? 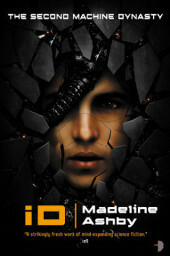 iD takes us back to the world of such sentient robots envisioned in Madeline Ashby’s debut novel, vN. In the first installment the vN (von Neumann machines) were slowly becoming a normal part of human life, as labourers, friends and partners, until Portia appeared. The mother of a vN called Amy, Portia developed a contempt for humanity and discovered a way around the failsafe, the inbuilt switch which causes vN to shut down on witnessing or even contemplating human suffering. Hiding away inside Amy’s consciousness, Portia triggered a round-up of vN, with the upshot finally being Amy, her vN partner Javier forming a massive, conscious raft, a floating haven for vN around the world. This is where iD opens, the island now a vN refuge protected by Amy’s lack of failsafe and Portia supposedly destroyed. However, Amy represents a threat which those in authority cannot stomach and it’s not long before they target the island in a devious attack, killing Amy and forcing Javier and the other vN to flee for their lives. Javier slips into the underground, hunting down a backup copy of Amy. Meanwhile his enemies are tracking him down, humans and vN alike. The trail for the sole existing copy of Amy, his last chance to be reunited with the vN he loves, leads him inexorably towards the religious cult which created his kind in the first place, created them to be servile companions for those unfortunate enough to be left behind following the Rapture. It’s not long before dark secrets and grimy skeletons start tumbling out of closets. At times iD is a truly uncomfortable read and this is one of its strengths. Ashby is not one to shy away from asking the questions we’d often rather avoid, no matter to which unpleasant corners of the human psyche they may lead. The core theme of iD is the human urge to control and subjugate. Fortunately most of us possess the moral checks and balances which prevent us from exercising this urge on our fellow humans. But what if that switch were turned off, if we were allowed free reign over those who were merely humanlike, who could do nothing to harm us, who we could convince ourselves weren’t ‘real’? The answers which Ashby uncovers in iD are unsettling and serve as a warning to be on our guard at all times. The treatment of Javier from the outset is stomach-turning, his failsafe manipulated for everything from sexual gratitude to murder and betrayal. As he delves ever deeper into the post-Amy world, a world ruled by distrust of vN, we learn more of how the humans have exploited the vN for all manner of purposes. This book does no favours for your estimation of the capabilities of your fellow man. In fact you might come away feeling more than a little dirty. Thankfully these explorations of our darker side and potential for evil never bog down the explosive plot and Ashby keeps things rocketing along at pace throughout. In fact it’s so well handled that the more cerebral aspects of iD seem to sneak into your subconscious without you even noticing. You’ll just suddenly find these thoughts roaming around the cellars of your brain with no idea how they got through the door in the first place. To me that’s one of the hallmarks of a great book.